Four days of in-depth training to develop understanding and effective language applications for improving how we use language to create and manage reality; identifying many common mistakes and limitations that create misery, undermine our effectiveness and happiness as human beings. Language is one of the defining features of being human. Language is one of our main tools for communicating, thinking, planning, and expressing our thoughts and feelings to ourselves and others. We also use language at a deeper level. We also use language to create and manage our core sense of reality. This greatly extends the range of possible meaning that we can experience in life. This benefit comes with great risks. Mistakes and inaccuracies at this level with undermine the effectiveness of communicating, thinking, planning, and expressing our thoughts and feelings to ourselves and others. We also use language to manage language. This is an additional benefit that also entails great risks. Again mistakes and inaccuracies can greatly undermine our effectiveness in all our language use. Increasing our understanding and skills in all areas of language can transform our abilities in all areas of life; improving our effectiveness in communicating, increasing our understanding, developing our ability to question relevantly, describe accurately, give instructions usefully and negotiate successfully. 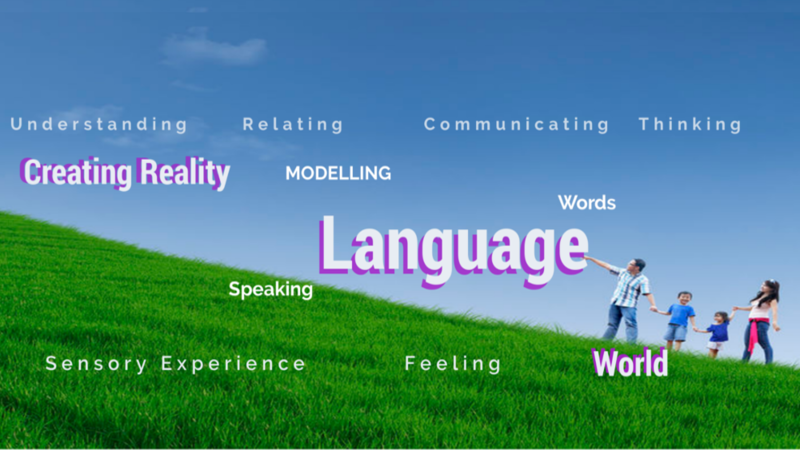 Through the process of Development Behavioural Modelling (DBM®) we can identify in detail how the different applications of language function and through this develop greater understanding and skills to work with language more effectively. Making sense of the world (Modelling the World), Organising Experience, Experiencing, Language Distinctions, Naming. Describing, Communicating, Performing, Expressing, Thinking, Investigating, Questioning, Stating, Directing (Commanding), Motivation and Attaining, Planning, Negotiating, Conflict Creation and Resolution, Creating, Changing, and Developing. Participants will develop skills for personal development and explore professional applications including coaching, therapy, counselling, advising, mentoring, managing, teaching and training. The course will explore the everyday structure and function of language rather than formal grammar; how we really use language. New language skills will be based on a thorough understanding of language and not through superficial tricks and scripts. Participants will develop skills in language production and a deeper understanding of how other people produce language. Many of the most common mistakes and dangers in language use will be explored adding a further level of personal defence to negative influences and an additional resource in helping others. The training is suitable for all those who want to this greatly increase the understanding in skill and language for personal development, professional development, and scientific development. How words are more than labels of things. How words shape and change our thoughts, feelings, and our experience of the world. How changing words can change our reality. Learn how this works and how to work it more effectively. Learn how different languages shape our reality in different ways. How words often have multiple meanings and multiple uses, and how we need to select carefully to be effective in our language applications. How words can be inaccurate and misleading; creating a false sense of reality. How these undermine everything we do that is based on them; our meaning, planning, action, our identity, meaning and fulfilment in life. To understand the deeper relationships between language and the world, and language and language. How we create new language with language. How our communication with ourselves and others can distract us from our experience of the world. How to stay connected to the world while creating and managing language. How language not only describes reality but also prescribes reality, how this is useful as well as dangerous, and how to manage this more effectively. How through language we can create more from what we experience, how this can result positively in new meaning, happiness, joy as well as in sorry and misery. Learn how to manage this more effectively for a more meaningful and joyful life. To explore and understand how language operates through our different levels of self –managing; World, Performing, Managing, Directing, and Supervising. How language relates across the different levels of Content, Technology, Methodology, Epistemology and Ontology. How to work effectively with reality, language and Ideals. How to be Clean, Clear, and Accurate in all language applications. As humans we are born with less built in instincts than other species. This gives us a survival advantage, we are not limited to behaviours that fitted a previous environment, and we learn about our current environment and in learning adapt to it or adapt it to us. This means that the unknown is a bigger issue for us. The more effectively we ‘go into the unknown’ the more effectively we will be able to explore the world. Effective exploring will supply the experience required for accurate understanding of our world and a practical basis for meeting our needs. All of us build our understanding of the world around us based on our experience. We continue to create and change this understanding throughout our lives. We call this understanding that each of us creates our ‘model’ of the world. By a model we mean “an organised dynamic representation of our world”. We do not respond to the world as it is. We respond to how we have made sense of it, how it is “meaningful” to us. We then respond to new things based on what we already “know”. Instincts build in responses for animals but human beings need to learn how to respond in our cultures, organisations, countries and families. This learning, the building of a model, is a process of Modelling. Developmental Behavioural Modelling DBM is the formal studying of the complete range of modelling. This includes the structure and function of models, how models are formally and informally constructed and applied. Developmental Behavioural Modelling DBM is a new field that offers a unique set of skills. The uniqueness lies in that it operates at a deeper level than the usual techniques and ready-made answers and solutions. DBM is a methodology not a fixed method. It offers a set of behavioural modelling skills to apply in any situation. DBM modelling skills are used to identify the specific needs of the situation and to create answers that fit the particular circumstances rather than applying a pre-packaged solution. This makes DBM a very practical approach. It also means that there is a greater need for skills and appropriate models. Over thirty five years of development in practical applications in Social Services, Education, Psychotherapy and Business have gone into the development of DBM. John McWhirter, the developer and Master Trainer of NLP, has drawn upon the most effective approaches in therapy, education and business together with skills and approaches of Neuro-linguistic Programming, Ericksonian hypnotherapy, Gestalt therapy, General Semantics, all within a framework developed from the work of Gregory Bateson, Cybernetics and Systems theory. The result is a constantly developing field that provides a revolutionary approach to understanding human behaviour, learning and development. Art and Science are two of the main areas of human creativity. They are often perceived as very separate; sometimes considered opposites or non-compatible. Unfortunately this can be quite a limiting way to consider them. Instead if we integrate the artistic and the scientific it is possible to gain considerably more than the sum of the parts. The great benefit of modelling is to identify the best in Art and Science and how best to combine them in all areas of human activity. In this workshop we will be exploring the integration of Art and Science in relation to effective language use. John has over 35 years’ experience of working with children, adults, families, communities and organisations. He has explored and developed models for 35 years creating over 750 models in Developmental Behavioural Modelling; a new field committed to the exploration and development of all things related to models and modelling. He was personally certified by Richard Bandler in 1990 as a Master Trainer of NLP. He is the creator of Re-Modelled NLP. He is the designer and main trainer in the DBM® Masters degree at the University of Valencia, Spain. He is based in Glasgow, Scotland where he is Director of Sensory Systems Training and coordinates research, development, and training and a private practice as a therapist and consultant.